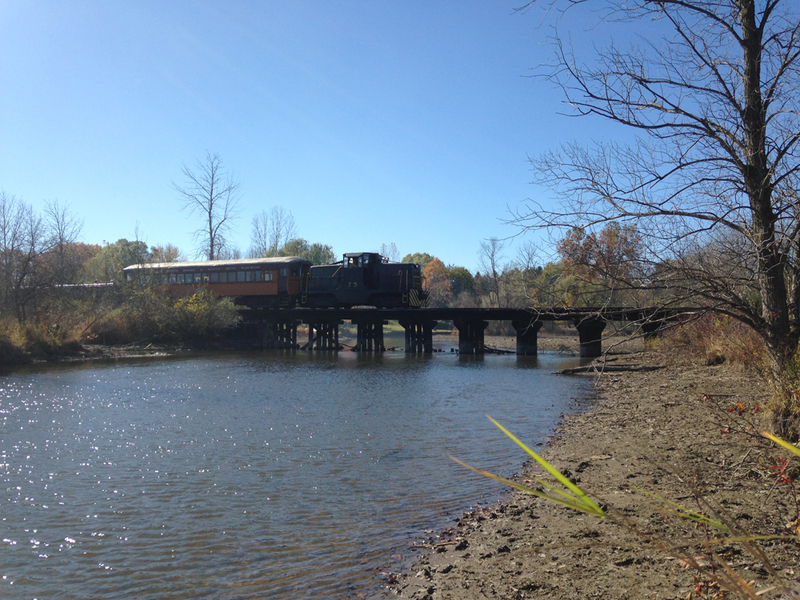 The area of Michigan that I live in has a colorful history when it comes to railroads. Every major eastern carrier at one time crossed lower South East Michigan through Monroe and Lenawee Counties. This article will take a look at one of the first and a little branch line that has survived since the beginning. The railroad in its early days (about 1855) in downtown Tecumseh. 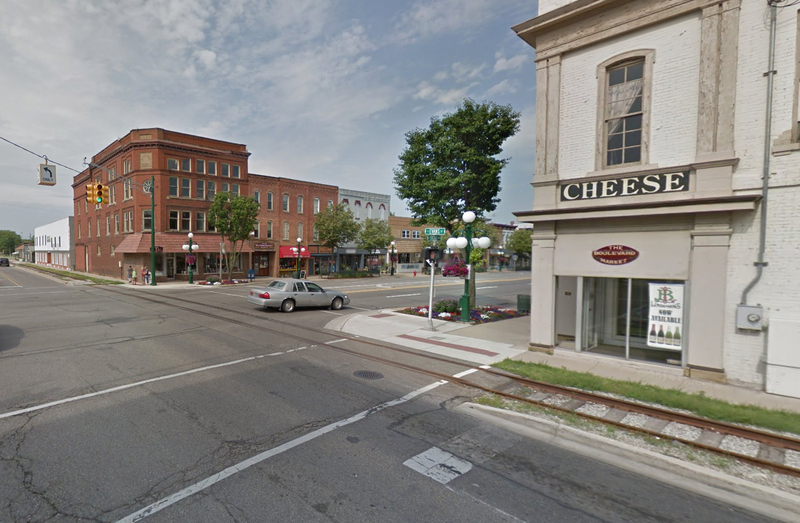 The railroad still runs through downtown Tecumseh to this day. Even before Michigan became a state, the territory funded a railroad to assist with the growth and development of the area. In April of 1833, a charter was granted to the Erie and Kalamazoo Railroad Company by the Michigan Territorial Council to construct a railroad from Port Lawrence (some these days refer to that area as Toledo) on Lake Erie to Adrian in Lenawee County, and then on across Michigan to the Kalamazoo River, which would give access to Lake Michigan. Construction reached the city of Adrian in 1836 becoming the first railroad in the Michigan Territory. Horse teams were used along the line. Even so it was the first railroad trip undertaken west of the state of New York. The first steam locomotives (Baldwins) arrived and operated in early 1837, with an average speed of 10 miles per hour (16 km/h). 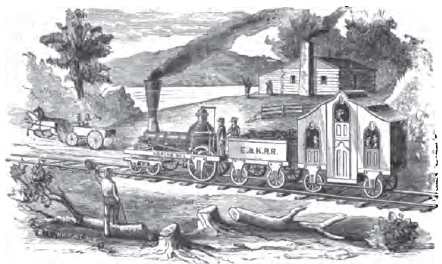 Artist’s depiction of an early Erie & Kalamazoo train. It should be noted that although the railroad was started in Port Lawrence, MI a dispute over the area (see Toledo War) and a compromise backed by President Andrew Jackson resulted in Port Lawrence being handed over to Ohio and Michigan receiving the upper peninsula in exchange for the loss. 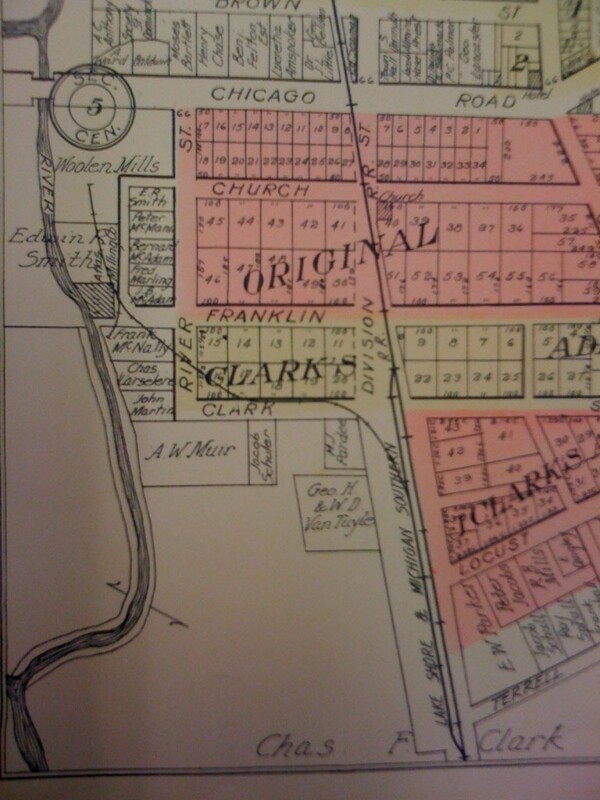 Taken from a 1876 Lake Shore and Michigan Southern Route Map, the Palmyra and Jacksonburgh is highlighted in yellow. the LS&MS had control of the line by this time. 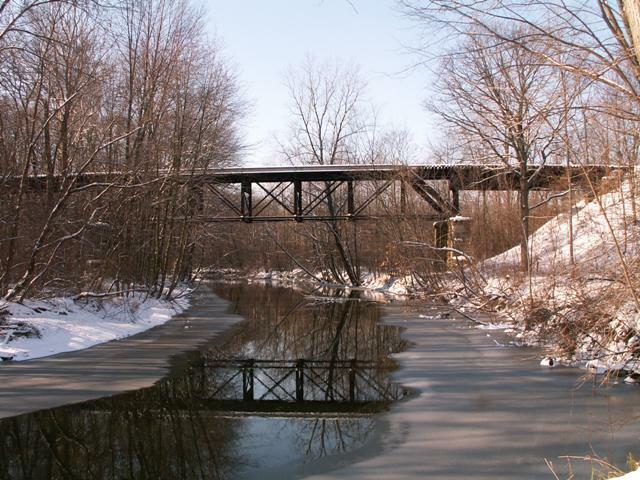 Railroad construction was becoming so popular that even before the Erie and Kalamazoo tracks reached Adrian in 1836, the new Palmyra and Jacksonburgh Railroad Company (under the control of the Erie and Kalamazoo) received a charter to construct a branch railroad 46 miles long. 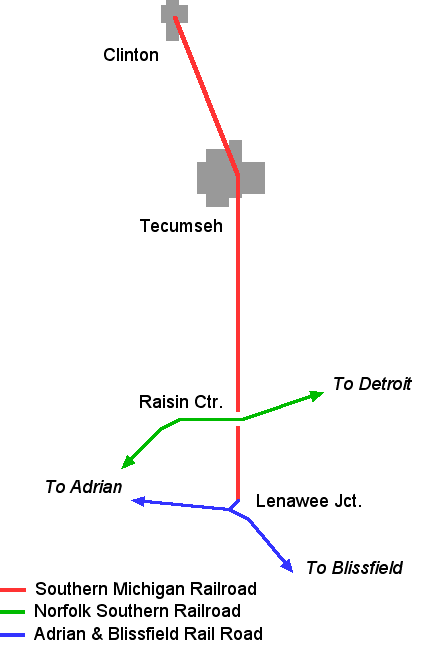 The line would run north from a junction with the Erie and Kalamazoo near Palmyra (Lenawee Junction) and proceed through Tecumseh, Clinton and Manchester into Jacksonburgh (later called Jackson) in Jackson County. Lenawee junction as it looks today. The south line goes to Toledo, while the west line goes to Adrian. The line going north is the Palmyra and Jacksonburgh Railroad The east-west line used to cross the north south line in the middle of the wye. The line to the east was removed in the 1980’s. Construction began in 1837, the year that Michigan became a state. 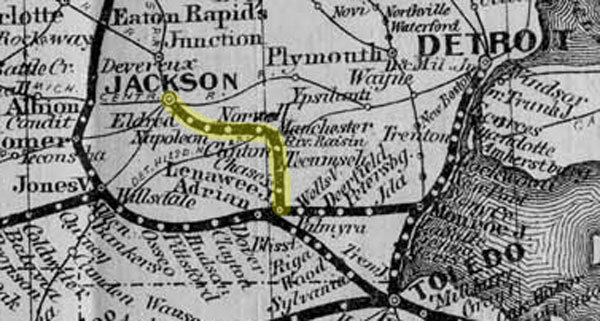 From Lenawee Junction on the Erie and Kalamazoo Railroad, the new Palmyra and Jacksonburgh Railroad reached Tecumseh in 1838. The line did not proceed any further for 20 years as the railroad struggled survive. 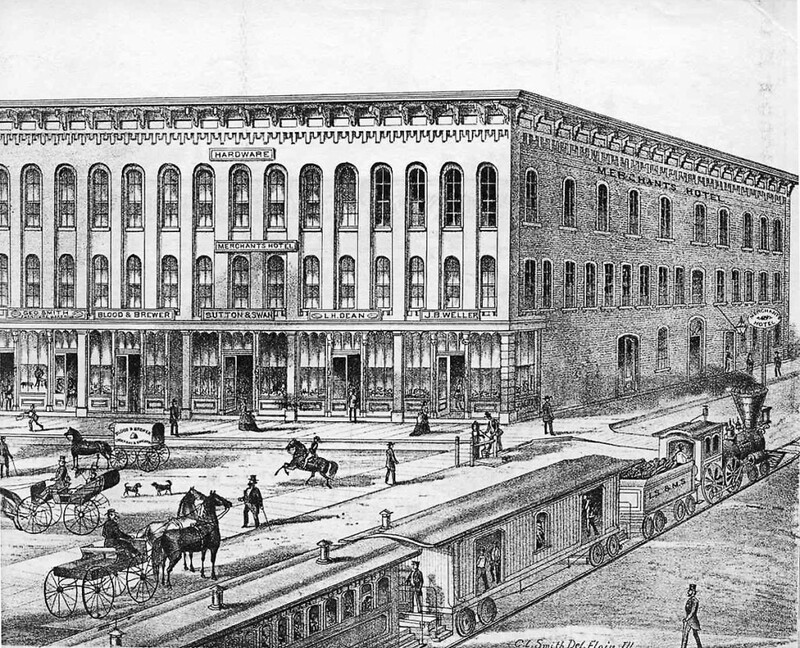 In 1844 the state took control of the line and in 1846, the state sold its Southern Railroad (including the Palmyra and Jacksonburgh Branch) to a new company, the Michigan Southern. Under its direction, construction began again, and the Palmyra and Jacksonburgh Railroad reached Clinton in 1853, Manchester in 1855 and Jacksonburgh in 1857. 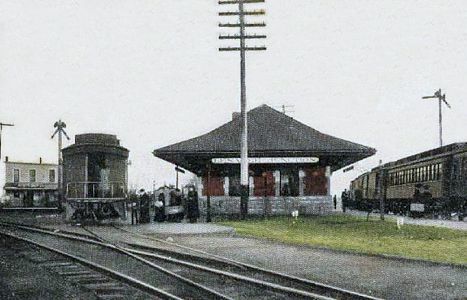 The Jacksonburgh Branch (as it was called then) was completed, forming the first rail connection between Lake Erie and Jacksonburgh, Michigan. The line crossing the River Raisin south of Tecumseh. The line was known as the Palmyra & Jacksonburgh Railroad for some time after completion even though it was operated by the Lake Shore & Michigan Southern until 1915 when it was rolled into New York Central Railroad. As with the rest of the railroad industry the line began to see much less traffic after 1930 and again after WWII. In 1965 the tracks between Clinton and Jackson were abandoned and removed, cutting the branch off from Jackson Michigan. The New York Central folded into the Penn Central Railroad in 1968 and in 1970 the Penn Central filed for bankruptcy. 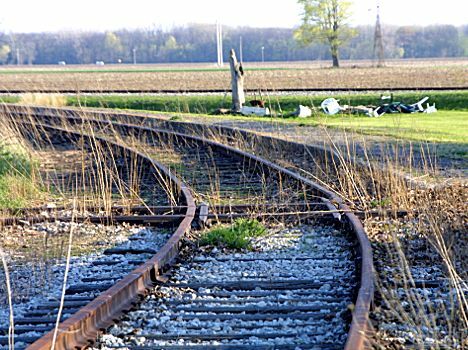 In 1981 its successor, Conrail, filed to abandon what was left of the lines that crossed southern Michigan including the Palmyra and Jacksonburgh line from Lenawee Junction to Clinton. In 1985 the Southern Michigan Railroad Society, led by three high school students, purchased the Clinton Branch and transformed it into an operating railroad museum. The society continues to preserve, restore, and to educate the public about the first railroad in Michigan. They offer various trips on the remaining tracks of what used to be an operating railroad, and work on a volunteer basis. They offer various tours of the line and support local community events. As with most early railroads, passenger traffic was a primary purpose for the railroad along with freight. In the early days, rail was the primary mode of transportation. In the early 1900’s the line saw at least 8 scheduled trains per day. 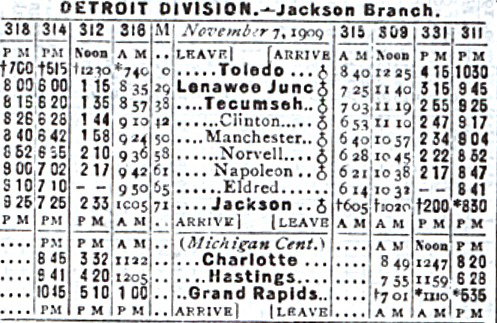 The schedule from 1910 shows that eight passenger trains a day passed Tecumseh. Although located on a branch line the line saw a lot of traffic. By the 1930’s the car had taken a sizable bite out of the passenger traffic. The New York Central started using rail-cars to service the line. The last scheduled passenger train on the branch was in 1939. The line operated for so long that several industries have come and gone on the line. In the early days, the area was mostly agricultural. The major towns on the line were Tecumseh, Clinton, Manchester and Jackson. Jackson was the largest city to be served and generated through traffic for Toledo along with interchange to the Michigan Central. Today only Tecumseh and Clinton retain the old tracks. Clinton Sanborn Map showing track arrangement. Note how the Atlas Feed Co. requires a switchback. Prior to the railroad entering town, Clinton was on the primary stage coach road between Chicago and Detroit. Industry grew fast to take advantage of the new rail line. 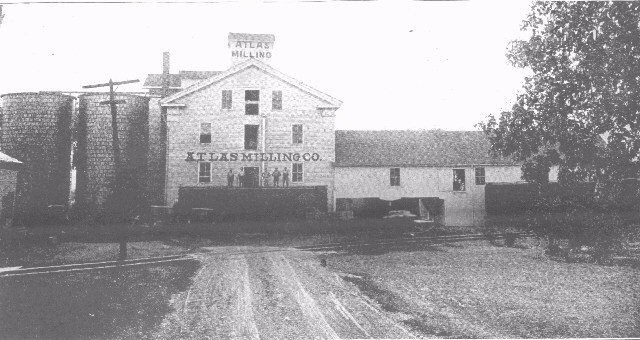 In 1840 the Atlas Feed Company was in operation and the large Clinton Woolen Mill was organized in 1866. By then the following businesses were found in Clinton: 4 dry goods stores, 4 groceries, 4 shops, 1 hardware store, 1 cabinet shop, 2 millinery shops, 1 barber shop, 1 paint shop, 2 meat markets, 2 saloons, 4 wagon shops, 2 blacksmith shops, 1 grist mill, 1 plaster mill, 1 shingle factory, 1 depot, 1 tannery, 1 refreshment room. The railroad had a small yard and a large freight house to service the wide array of businesses. The freight house survived until it was torn down in 2010. The Atlas Feed mill circa 1923. Note the foreground tracks that led to the switchback. Clinton and the surrounding area was one of the largest wool producers in the US. The Clinton Woolen Mill manufactured cloth for soldiers in both World Wars and during the Spanish American War. It also produced material for fire, police and school uniforms and for automobile upholstery. In 1957 the Mill closed because the automotive companies, chief users of the mill’s wool, had begun to use synthetics as upholstery fabric. View of unique track arrangement in Clinton. Because of limited space, the railroad had to cross it’s own track twice to access the mills. Tecumseh was a small farming community up until the late 1800’s. With the arrival of two additional railroads (Detroit, Toledo & Milwaukee and the Detroit, Toledo & Ironton) several industries developed south of the downtown near the crossing. 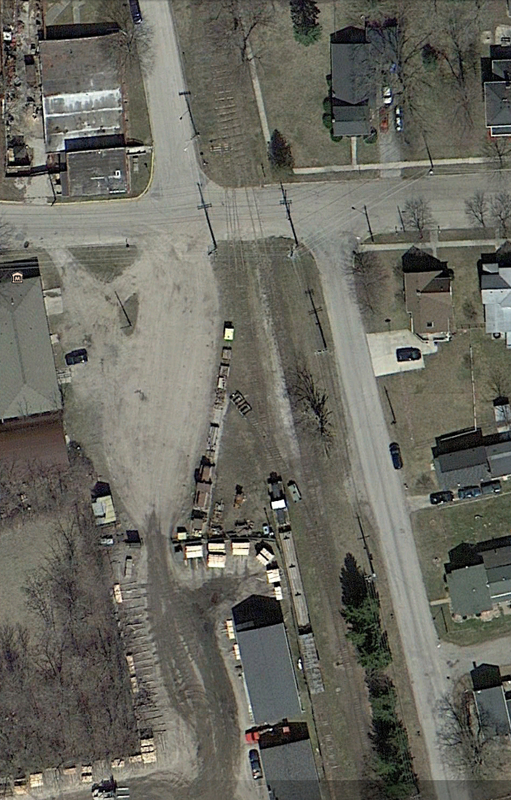 Tecumseh had two small railroad yards. 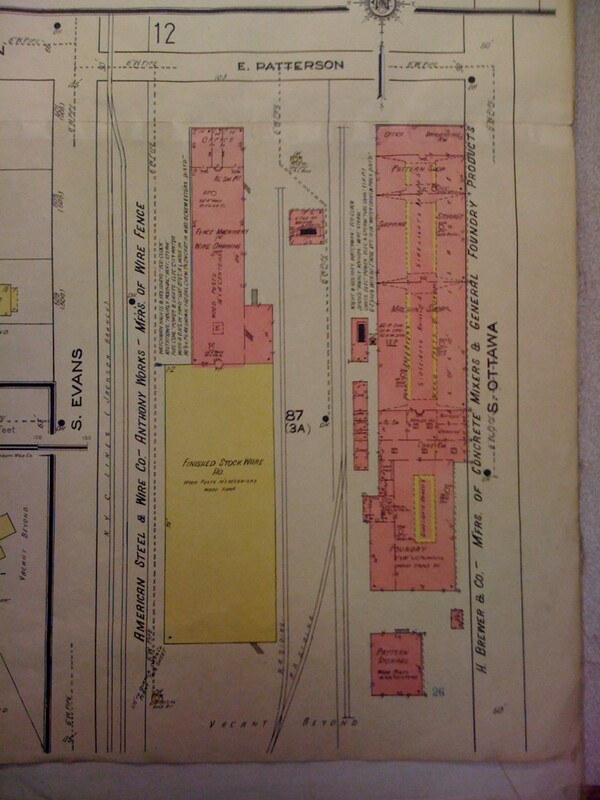 The North Yard was on the original Palmyra and Jacksonburgh line and was just north of downtown. adjacent to it over the years could be found the stock pens, team track, lumber yards and coal dealers of many small rural towns. 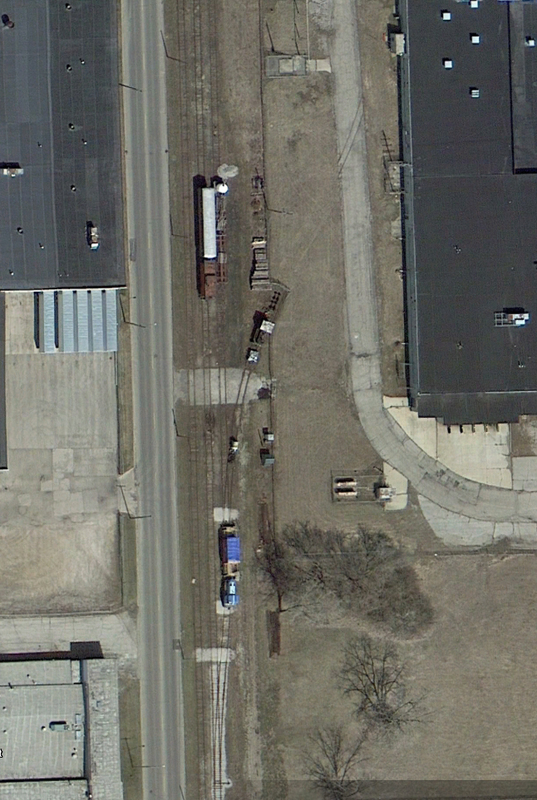 The South Yard was just south of where the DT&M crossed the Palmyra and Jacksonburgh Railroad. The DT&M did not last long on it’s own. It fell under Vanderbilt influence early and was operated by the Lake Shore and Michigan Southern. 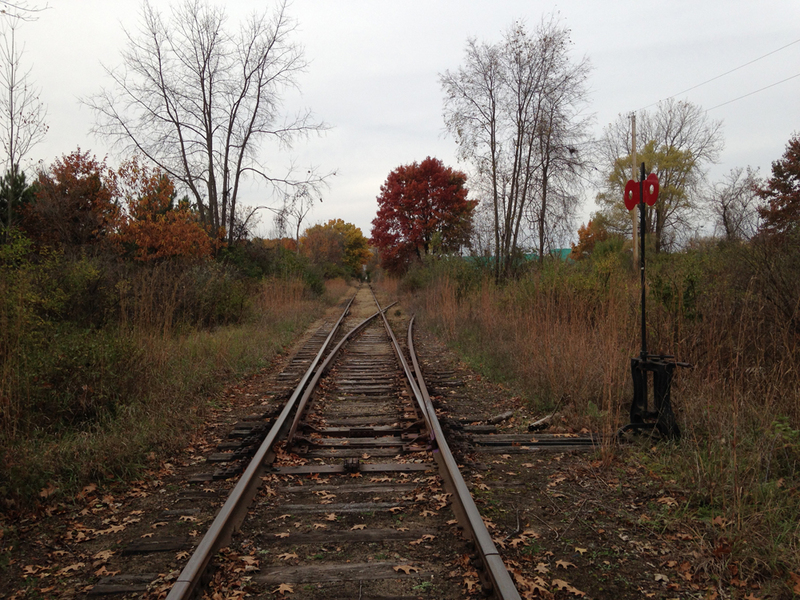 The DT&I line merged into the old DT&M line (around 1895) just before the crossing the Palmyra and Jacksonburgh line. Up until Henry Ford ownership, and a rework of the line, the DT&I operated through trains on the DT&M line to Dundee to gain access to Detroit. The South Yard handled interchange to the DT&I and serviced several larger industries south of downtown. Up until the great depression these included a foundry, equipment manufacturing, fencing company and a mill. Many of these businesses went away during the depression. The Tecumseh Products Company acquired one of these building near the south yard in 1934 and over the years became the largest industry in the area. 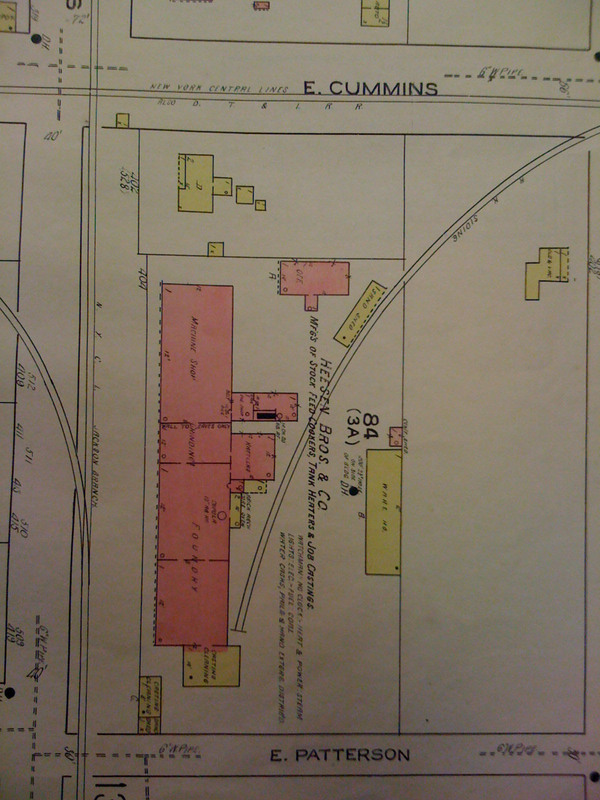 South Yard and adjacent industries that later became part of Tecumseh Products. At this time the South Yard was nothing more than a pair of tracks. View of southern portion of the South Yard showing one of the branches into the Tecumseh Products Factory. The building in the upper left is the old Quaker Oats plant. There was only one track connecting the Palmyra and Jacksonburgh line to the old DT&M line. A portion of the old DT&M line and the interchange track are still there today. The Building in the upper right was used by both the DT&I and the LS&MS/NYC for a variety of purposes. 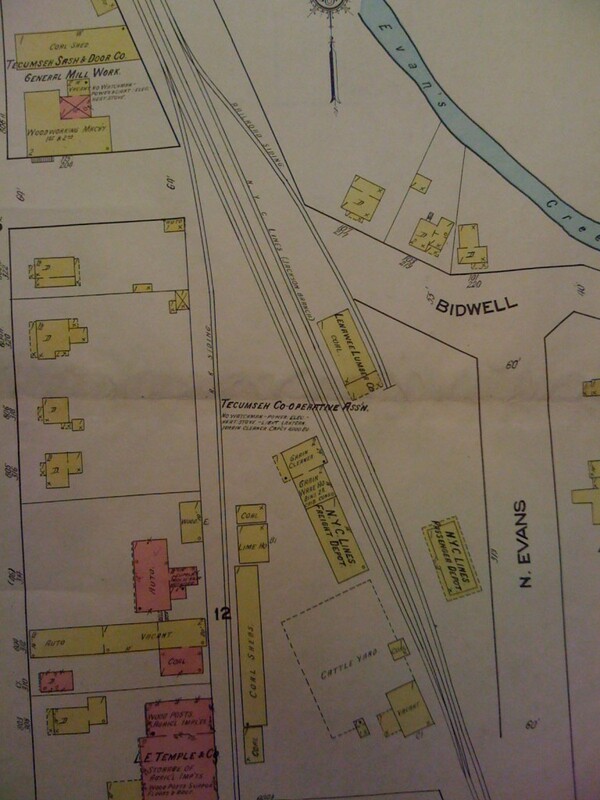 A few sidings and industries existed outside of the towns as well. One of the more interesting was the Potato Chip operation that was located exactly half way between Clinton and Tecumseh. In the 1930’s there were 31 potato chip companies in the City of Detroit. These operations required a a large quantity of potatoes to meet demand. 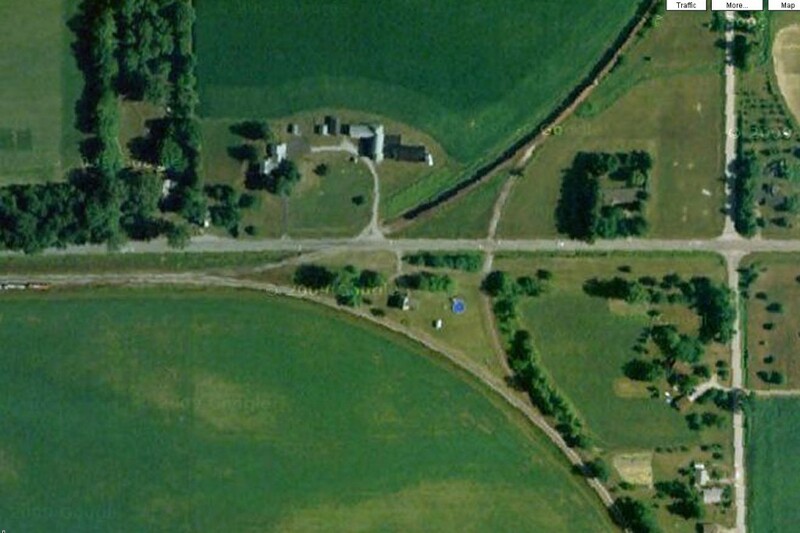 One of these farms was located exactly halfway between Clinton and Tecumseh. The farm had it’s own spur and warehouse for the shipment of the potatoes. Remnants of the siding and a portion of the warehouse still survive. Old potato warehouse and siding. The area around Tecumseh and Clinton has also seen a large number of gravel pit operations. In the years between 1900 and 1950 these were serviced by the railroad. In more modern times (1950 until the line was abandoned) newer industries were located on the line such as automotive parts manufacturers. Abandoned turnout into automotive industry. 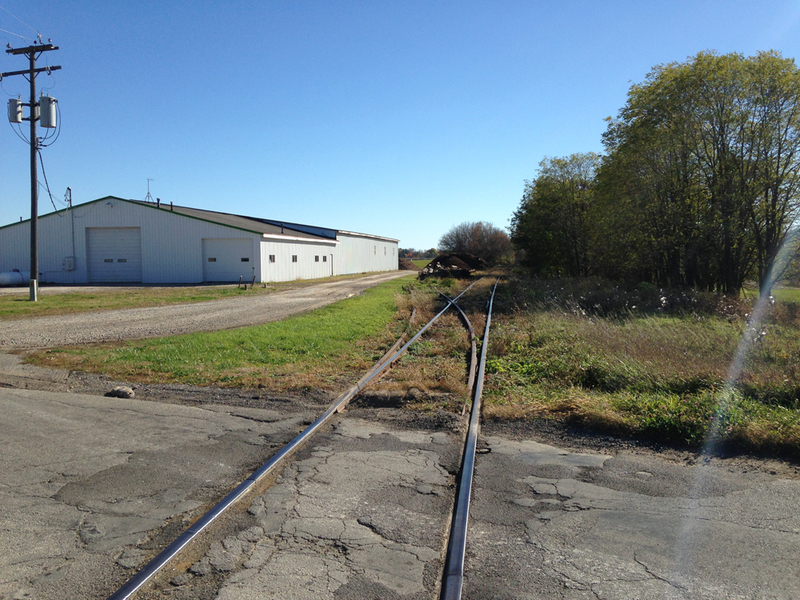 Today, the line still exists between Lenewee Junction and Clinton but there is a gap in the line where the tracks cross the Norfolk Southern (ex Wabash) line. Since the line was officially abandoned back in 1981, the Norfolk & Western at the time, removed the crossing. Today, excursion trains are operated on the line between Tecumseh and Clinton by the Southern Michigan Railroad. 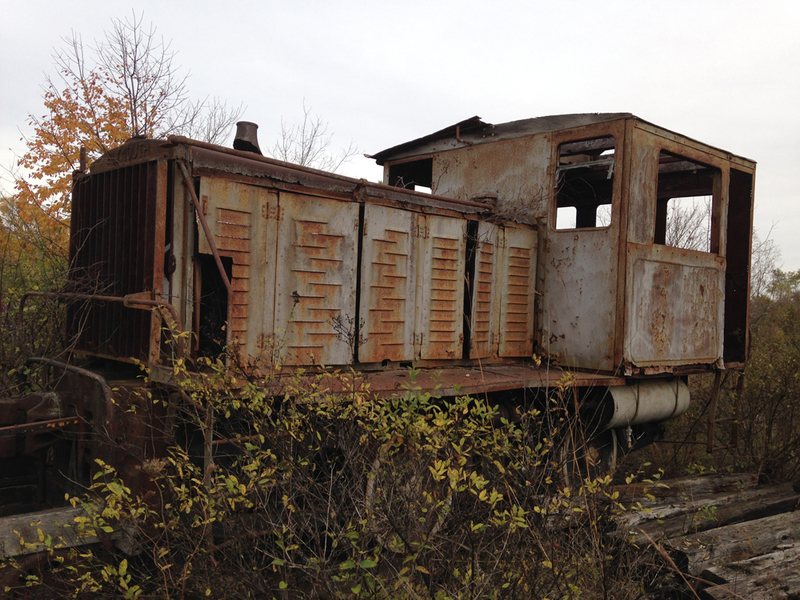 The Southern Michigan Railroad uses a unique variety of old equipment including the only example of a GMD GMDH-3. The Palmyra and Jacksonburgh line has something for almost everyone. It has existed sine the 1840’s and was in continuous revenue use until the 1980’s so it is sutable for almost any era. It is small enough to modeled as a whole or there are many small portions to inspire a small switching layout or puzzle. Old critter abandoned on one of the old industrial sidings. Very detailed and thoughtfully written article. I would suggest giving a copy to your local History Society and library. Much of this kind of detail just does not exist. I am building a similar layout based on North Central MA. Great suggestion. I will do that. With regard to Clinton, though, you wrote “The freight house survived until it was torn down in 2010.”. As far as I know, this building still survives. 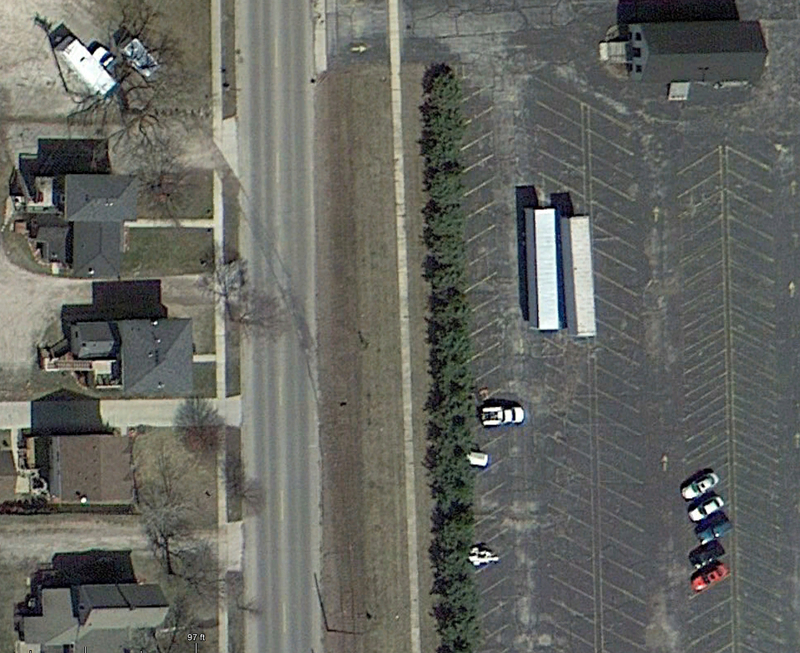 Google and Bing satellite maps in 2015 still show it. There are other buildings around still but their use is unclear to me. That video shows the demolition of the freight house in Ft. Wayne, Indiana! The freight house in Clinton, Michigan is a much smaller, wood structure and still stands, as far as I know. This was not a railroad building. This was the office building for the foundry which was located on this site (last operating as the Bruce Foundry until destroyed by fire ca. 1965). 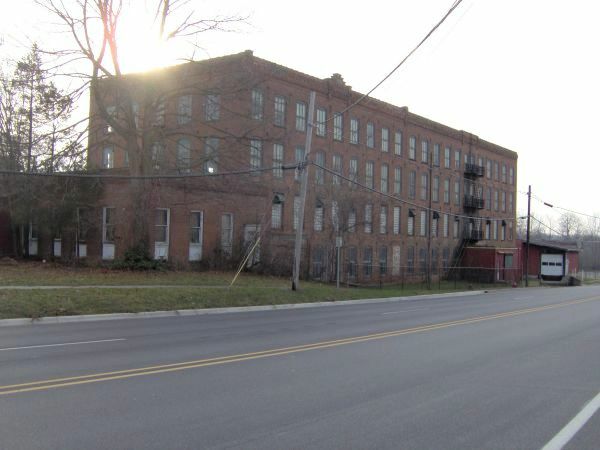 The building was then used by the Tecumseh Products Company. Thanks for the information on the building. I was once told that by a historical society person.